TEMPTING FATE Launch Video For "I'd Rather Burn"
If you are unfamiliar with the Los Angeles based band, TEMPTING FATE, then you best strap in, as they bring the ruckus with their most focused and hard-driving track of their young career with this blistering new track, “I’d Rather Burn”. The new song was produced by the renowned, Drew Fulk (CANE HILL, MISS MAY I), and is also now available for sale across all DSP’s and for free on Spotify! 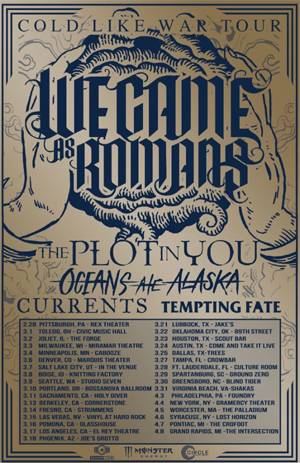 The striking new video for "I'd Rather Burn" was shot by Brian Cox (HOLLYWOOD UNDEAD, BUTCHER BABIES), so check it out and don’t miss the band touring alongsideWE CAME AS ROMANS, THE PLOT IN YOU, OCEANS ATE ALASKA and CURRENTS starting Feb 28th. Watch the “I’d Rather Burn” Official Music Video on KNAC.COM HERE. Cory Beecher (Vocals) states: "We're beyond excited to introduce the world to the new direction we have taken with the band. While very familiar to the original TEMPTING FATE sound that people have grown to know and love, we have really focused that sound and went in a more Hard Rock/Heavy Metal direction. It's still us, and it's still true to our roots but much more mature and direct. It took us a while to find our place but we truly believe we have found it with our new music. It's been an absolute blast and a true honor to work with Drew Fulk both writing and recording this new material. He's a musical genius and has really helped us to discover ourselves as a band and musically. We can't wait to show the world what we're made of and you can expect every ounce of intensity and more in our live performance as you see in our new music video for "I'd Rather Burn". The live show will be intense, in your face and an experience to say the least! It's something you're not going to want to miss!"